Make you favorite photos and songs into slideshow and then burn it into DVD is very simple. Slideshow DVD Creator can help you create a professional-looking slideshow within minutes. Drag & Drop your songs and images directly into the soft, then add transition effect, theme, text or others you want to be showed on the photos by just clicking the icons, then you can have your own slideshow. 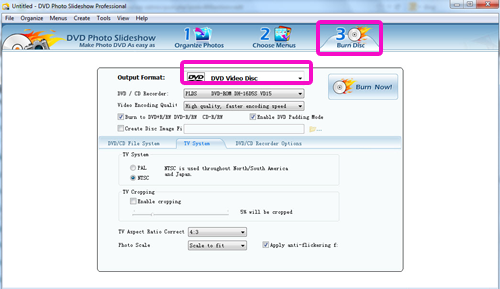 Before burn it into DVD, you can also add DVD title, Menu or even background music for your DVD slideshow. Let’s see how to do it. Of course, you have to download and install the Slideshow DVD Creator software. Although it is a shareware, but the download is free. And because the only difference between the full and the trial version is the limitation on photo number. You can have a full try before purchase the software. The Website is : http://slideshowdvdcreator.com . 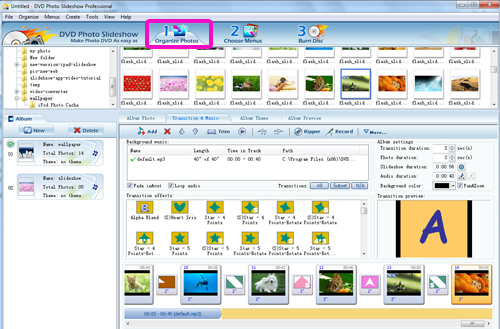 After you install the Slideshow DVD Creator, you can see the software screenshot as below. In the left panel, it has “Images, Music, Theme, DVD menu, options” for you. First you can add the photos and songs you liked to the software. Now you can have a simple slideshow with background music. Then you can select transition effect for each photos. Of course, you can apply the same effect to all the photos as well. The transition effect will help show photos in different ways. Just click the icon between the photos. so far, you can click the play button below the preview box to play your slideshow. Then you can adjust it according to your needs. In many conditions, you may like the song and the photos and end at the same time. Slideshow DVD Creator also has the “Sync the images and music” function. Click the “Options”, then go to “Music” tab. By click the “Sync Music & Slideshow“, you can have them synchronized. Last, set DVD video Aspect and TV system as below. Then you can insert the DVD disc into your computer, and click “Burn DVD” to make your own DVD. This entry was posted in slideshow dvd mac and tagged DVD menu, DVD Photo Slideshow, DVD title, slideshow dvd on August 23, 2013 by Sarah Jablich.